Exposed Aggregate is a popular choice of finished concrete that exposes or encourages the pebble or stone on the surface of the concrete to show. The level of exposed aggregate depends on the installation and the pebble chosen. The finished look is that of pebble sized aggregate throughout the concrete and the coloration is primarily derived from the color of the aggregate chosen. 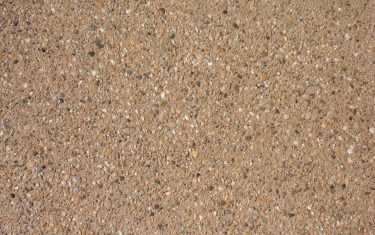 Exposed aggregate can be stained or dyed to shift or change the color upon completion. Exposed aggregate is done by using a chemical retarder on the surface of the concrete during its placement. The retarder keeps the cement on the surface from hardening and then allows the unhardened cement to be sprayed or washed of. The end result is a pebble surface finish called exposed aggregate. Exposed aggregate can be done in many different ways but the final look is often quite similar. 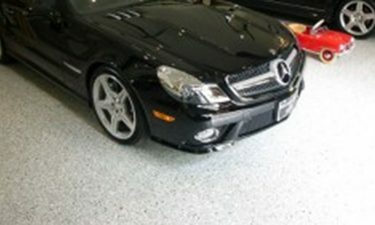 We use this finish to show the natural beauty of the stone in the concrete without having to add additional coatings or color. 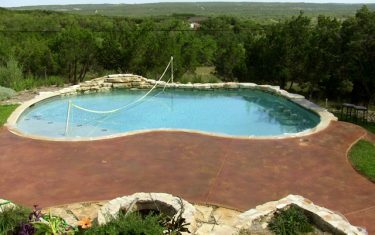 It is also a cost effective method of getting a decorative concrete finish. 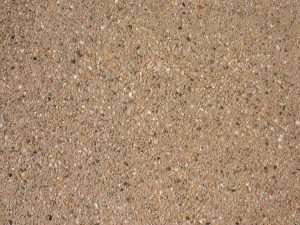 Design options for Exposed Aggregate. 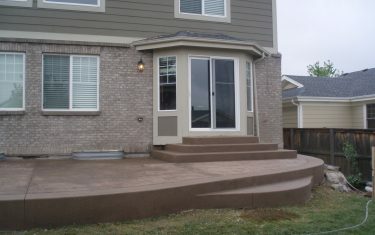 Add integral color into the concrete mix. 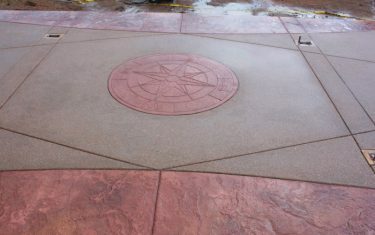 The cement in between the stone will still be visible and will add a complete color hue across the entire concrete surface. Acid stain the finished aggregate. 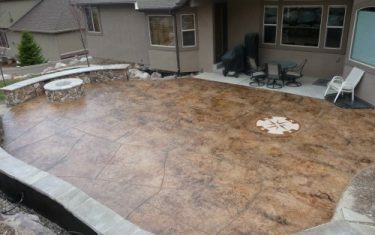 By acid staining the concrete surface when cured the cement will be colored along with certain rock/aggregate that will take on some color. 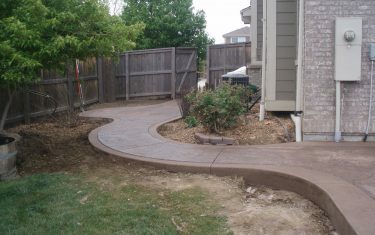 This is a nice way to add a variegated color to the concrete and adds depth of color as well. Cut patterns. 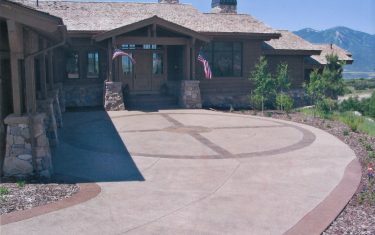 An exposed aggregate finish can have cut patterns to add some interest and design to concrete. By using large cuts you can simulate tile or large slabs of stone. Leave some stone areas unexposed. 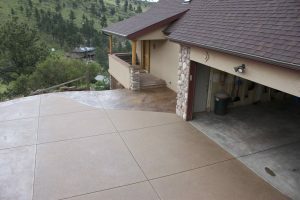 During the installation phase of Exposed Aggregate it is possible to not spray some areas (like a border) and leave it smooth or stamp a pattern into it. This will break up the monotony of a large expansive slab and add a decorative touch as well.